The story of what took place on the tramp steamer Californian the night of April 14, 1912, is one of those tales that cause some people to argue and fight, and others to just shake their heads in disbelief. Five white rockets fired at intervals over a period of about half an hour were seen by Stone before the Apprentice James Gibson came up again from below. When Gibson arrived, Stone told him about seeing the 5 rockets, and mentioned that he had called down to Capt. Stanley Lord on the speaking tube to report what he had seen. After watching the stopped steamer for some time and trying to call her up on the Morse lamp himself for about three minutes, Gibson observed “a white flash apparently on her deck, followed by a faint streak towards the sky which then burst into white stars.”  All together, Gibson and Stone would see two more of these rockets before the ship they were watching disappeared from sight. On the Titanic to the southeast, Fourth Officer Joseph Boxhall was put in charge of firing off distress socket signals trying to get the attention of what looked to be a 4-masted steamer that was seen off Titanic’s port bow. According to Boxhall, the distress signals were fired from Titanic’s boat deck out of a “socket in the rail just close to the bows of the emergency boat on the starboard side.” He said that when they are sent up, “you see a luminous tail behind them and then they explode in the air and burst into stars.”  He also said that they fired off “between half a dozen and a dozen” as far as he could recall. What is clear in both accounts is that the steamer they were observing had gone out of sight about 2 a.m. In his sworn testimony before the British Wreck Commission, James Gibson was a bit more precise about the time he was sent below to inform Capt. Lord that the steamer had disappeared. He said that Capt. Lord had asked him the time, and that it was “five minutes past two by the wheelhouse clock.”  This is one of those rare instances where we have a clear reference to an exact time that we can relate other events to as we shall soon see. Fourth Officer Joseph Boxhall was sent away in emergency lifeboat No. 2. During the firing of Titanic’s distress rockets and her failed attempt to communicate by Morse lamp to what looked like an approaching 4-masted steamer, Boxhall was assisted by Quartermasters George Rowe and Arthur Bright. Lifeboat No. 5 was the second lifeboat to be launched. It was lowered just a few minutes after No. 7. “At about 3:20 looking over the weather cloth, I observed a rocket about two points before the beam (Port), which I reported to the Second Officer. About three minutes later I saw another rocket right abeam which was followed later by another one about two points before the beam. I saw nothing else and when one bell went, I went below to get the log gear ready for the Second Officer at eight bells.” – James Gibson. “We saw nothing further until about 3:20 when we thought we observed two faint lights in the sky about SSW and a little distance apart. At 3:40 I sent Gibson down to see all was ready for me to prepare the new log at eight bells.” – Herbert Stone. In the wireless log of the steamship Mount Temple there was an entry, “1:25 [NY time] MPA [SS Carpathia] sends: ‘If you are there, we are firing rockets.’” As we shall soon see, 1:25 a.m. in New York corresponded to 3:15 a.m. on Californian. 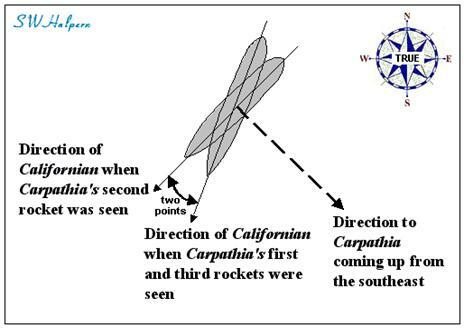 What both Gibson and Stone observed at about 3:20 a.m. were rockets coming from Carpathia that were sent up, according to Carpathia’s Capt. Rostron, “to reassure Titanic” as the Carpathia was speeding to the rescue. At the time the first of those three rockets were seen on Californian, Carpathia was about 40 minutes away from coming alongside emergency lifeboat No. 2 with Joseph Boxhall in it, the first boat to be picked up. She was coming up from the southeast on a heading of North 52° West true (308° by modern notation) at a speed of 15 to 16 knots. When her rockets were first seen by Gibson and Stone, Carpathia would have been about 10 nautical miles to the southeast of where Titanic’s wreckage and lifeboats were. Although Second Officer Stone wrote that the bearing to the last two of these “faint lights” were to the SSW, we know from Capt. Rostron that Carpathia came up from the southeast. We also know that the steamer that sent up those 8 white rockets that were seen earlier had stopped to the southeast from Californian, something noted by both Stone and Third Officer Groves when Stone came up to relieve Groves at “about 8 minutes past 12.” The problem created was Stone’s insistence that the steamer they were watching had turned around and disappeared in the SW. As we have seen, he told that to Gibson when he sent him down to report to Capt. Lord at 2:05 a.m.
What we can be sure about is that those 8 white rockets seen from the bridge of Californian came from Titanic, and Titanic was surely not steaming away while those distress signals were being sent up. What Stone saw was a change in the relative bearing to the steamer and rockets which came about from some erratic swinging of his own ship at times, something he nor Gibson had recognized. Despite what some people may want to believe, Stone and Gibson were not constantly watching that so called mysterious vessel. As Gibson remarked more than once, they had to look over the weather cloth in order to see it, something which may explain why only 3 more rockets were seen after he arrived back on deck and was told by Stone about the first 5 rockets that were seen. Although the general direction that Californian’s bow was swinging that night was to starboard over a period of several hours, the fact that the second of three rockets sent up from Carparthia was seen right on the port beam while the first and third were seen about two points before the port beam is almost certain proof of some sort of erratic movement opposite to the general direction in which Californian was swinging that night. 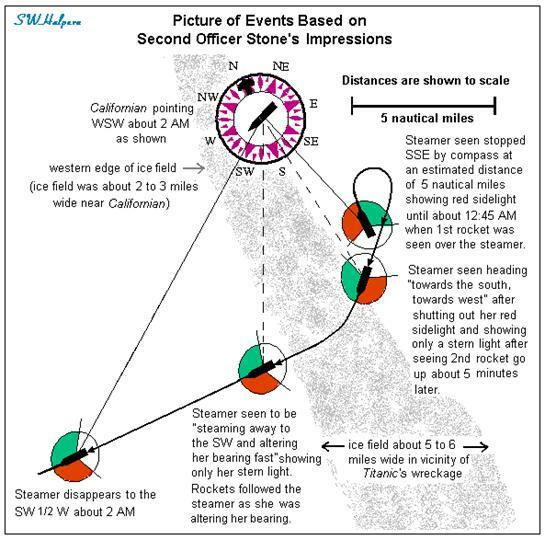 It is no wonder that Stone wrote that “the vessel was steaming away fast” before she “had gone out of sight” close to 2 a.m.
Before we address the implications of a 12 minute difference in clock times between Titanic and Californian, we need to explain why two different inquiries and a hearing to limit White Star Line’s liability failed to get the correct difference in time between Titanic ATS and New York time. When Groves came down to the bridge deck from the upper bridge around 11:30 to report seeing a steamer approach, Lord gave him instruction to call her up by Morse lamp and see if he can get a reply. Groves then went back up, rigged the Morse lamp, and spent a few minutes trying to communicate with the vessel. Capt. Lord testified that “we signaled her, at half past 11, with the Morse lamp. She did not take the slightest notice of it. That was between half past 11 and 20 minutes to 12.”  During that time, Groves noticed that the steamer had stopped, and thought that many of her deck lights had been shut out. He also noticed that the steamer was showing a red sidelight. At 11:40 p.m., he heard one bell strike on Californian to inform the watch below that they were due on deck in 20 minutes. Having heard from a host of witnesses that Titanic struck an iceberg at 11:40 p.m., the Wreck Commission apparently concluded that Groves’ noticing deck lights being shut out at 11:40 p.m. must have been one and the same event. Therefore, to them, it must have seemed that Titanic’s clocks and Californian’s were keeping the same time. If only they would have looked a little harder without prejudging the situation, they would have discovered that the two times could not have been the same. During the 1915 Limitation of Liability Hearings in New York, questions were raised as to the time of collision and the time of foundering. In the amended answers of the petitioner, the Oceanic Steam Navigation Company,  to the interrogatories annexed to the answers of Frederic K. Seward, the time of the collision was given at 10:06 p.m. NY time on April 14, 1912, and the time of foundering was given at 12:41 a.m. NY time on April 15, 1912. The difference between these two events is 2 hours 35 minutes. The foundering time was generally accepted at 2:20 a.m. Titanic time, but the time of collision was reported by various witnesses to be between 11:40 p.m. and 11:45 p.m. for the most part. Titanic’s Fourth Officer Joseph Boxhall told Senator Smith on day 10 of the American Inquiry in 1912 that the ship collided with the iceberg about 11:45 p.m.  Again, this gives a 2 hour 35 minute difference between time of collision and time of foundering. Now equating 11:45 p.m. Titanic time to 10:06 p.m. NY time, or 2:20 a.m. Titanic time to 12:41 a.m. NY time, we get a difference between Titanic time and NY time of 1 hour 39 minutes, or 3 hours 21 minutes behind GMT. So the question is how did they arrive at that particular time difference? The answer is not very hard to find. What they did is take Boxhall’s famous, and now known to be erroneous, SOS longitude of 50° 14' W, and determined the time difference between a clock set for that longitude and a clock set for the prime meridian at Greenwich. That difference is 3 hours 21 minutes. Since NY time was kept for the 75th meridian, which is exactly 5 hours behind Greenwich, the difference between a clock set for Boxhall’s SOS longitude and one in NY is simply 1 hour 39 minutes. So there is very little mystery on how the White Star Line derived the answers to the two questions that were asked of them. They simply took 11:45 p.m Titanic time for the collision, and 2:20 a.m. Titanic time for the foundering, and subtracted 1 hour and 39 minutes from each to get those times in terms of New York mean time. It was a simple thing for the White Star Line to do, but it totally ignored how apparent time was set on board ships at sea which was based on the ship’s longitude at local apparent noon, not the longitude where they collide with an iceberg. On Monday afternoon, April 15, 1912, at 4 p.m. NY time, Capt. Rostron of the Carpathia sent a wireless message to Capt. Haddock on the Olympic that said that “Titanic foundered about 2:20 a.m., 5:47 GMT, in 41° 46’ north, 50° 14’ west.” The reference to 2:20 a.m. in the message is the time that most survivors reported seeing the stern go under. It is Titanic ATS. If we accept what Rostron reported in his message to Haddock as true, that 2:20 a.m. Titanic time corresponded to 5:47 GMT, then Titanic time would have been 3 hours 27 minutes behind GMT, or 1 hour 33 minutes ahead of NY time. Also notice that Rostron believed that Titanic sank at the coordinates worked out by Fourth Officer Joseph Boxhall that was put into the SOS messages sent out by wireless. And we know today that those coordinates were about 13 miles too far west of where Titanic really sank. At the American Inquiry the issue of the time difference between Titanic and New York came up several times. Senator Smith at one point told Fourth Officer Boxhall, “you seem to be the one upon whom we must rely to give the difference between ship's time and New York time; or, rather, to give ship's time and give the New York time when this accident occurred.” Boxhall then responded by saying, “At 11:46 p.m., ship's time, it was 10:13 Washington time, or New York time.” It was then that Smith asked him at what time did the accident happen, and Boxhall replied, “as near as I can tell I reckoned it was about 11:45.”  So it seems that Boxhall confirmed what Rostron conveyed to Haddock, that Titanic’s clocks were set 1 hour 33 minutes ahead of New York. So where did they get this time difference from? How did Rostron get this information? So how did Capt. Rostron get 5:47 a.m. GMT as the time of Titanic’s foundering? The key to the answer is in the amount of time that Titanic’s clocks were to have been set back that Sunday night. What apparently took place is that Capt. Rostron obtained the foundering time of 2:20 a.m. from Titanic’s surviving officers. They also must have discussed that clocks on Titanic were keeping April 14th time, and were to have been set back 47 minutes to get to April 15th time if it were not for the accident. Now if you simply subtract 47 minutes from an unadjusted clock showing 2:20 a.m., you get 1:33 a.m. That is 1 hour 33 minutes past midnight in April 15th hours. But confusion about all of this was just waiting to happen. Someone must have mistook the 1 hour 33 minutes past midnight time in April 15th hours as the difference between Titanic time and NY time when the ship foundered. What then happened was that Rostron, or whoever worked it all out, subtracted 1 hour 33 minutes from 5 hours (the difference between GMT and NY time) to get what he thought was the difference between Titanic time and GMT. This difference comes out to be 3 hours and 27 minutes. He then added this 3 hours and 27 minute difference to 2:20 a.m. Titanic time to get 5:47 a.m. GMT. And it was that time that was put down as the foundering time in the wireless message sent to Capt. Haddock on the Olympic that Monday afternoon. Clearly a major misunderstanding resulting in a major mistake. Unfortunately, it was not recognized by anyone at the time, including Titanic’s surviving officers. Thus we see how confusion, and maybe some hasty calculations, easily leads to erroneous results. It should also be noted that this 1 hour 33 minute time difference never came up at the Wreck Commission Inquiry a few weeks later. Apparently, someone had recognized that a mistake was made. Senator SMITH. Did you have a watch or clock in your room? Mr. BRIDE. We had two clocks, sir. Senator SMITH. Were they both running? Mr. BRIDE. Yes, sir; one was keeping New York time and the other was keeping ship's time. Senator FLETCHER. The difference was about 1 hour and 55 minutes? Mr. BRIDE. There was about 2 hours difference between the two. Although Senator Fletcher suggested to him that the difference between clock times was 1 hour and 55 minutes, Harold Bride corrected him and said it was about a 2 hour difference. Although Bride could not remember specific times of many events, and was uncertain of many time intervals as well, the difference in time between the two clocks in the Marconi cabin is something he would have remembered since that difference was carried on both clocks from midnight Saturday night up to the time that he and Phillips abandoned the cabin just minutes before the ship sank in the early hours of Monday morning. 12:10 a.m. NY – Hear MGY [Titanic] calling very faintly, his power greatly reduced. 12:20 a.m. NY – Hear two 'V's signaled faintly in spark similar to MGY's [Titanic's]. Probably adjusting spark. 12:27 a.m. NY – MGY [Titanic] calls CQ. Unable make out his signal. Ended very abruptly as if power suddenly switched off. His spark rather blurred or ragged. Called MGY [Titanic] suggested he should try emergency set, but heard no response. The Virginian first picked up Titanic’s distress message at 11:10 p.m. NY time, 45 minutes after the first distress message was sent out. At 11:30 p.m. NY time, Virginian was reported at 170 nautical miles north of the SOS position. Titanic could not read Virginian’s signals, and Virginian had to communicate with Titanic by relaying messages by way of Cape Race. If we apply the 2 hour 2 minute difference between Titanic time and NY time to what was written in Virginian’s wireless log, we see that the last two messages above would have corresponded to 2:22 a.m. and 2:29 a.m. Titanic time. But Titanic was seen to go under at 2:20 a.m. by a number of survivors in the boats. So what did Virginian’s wireless operator hear at the end? Were those transmissions really from Titanic or from somewhere else? To answer this we have to look at a broader scope of evidence. 11.47 p.m. NY – MKC [Olympic] sends MSG [Master Service Gram] to MGY [Titanic]. MGY [Titanic] acknowledges it and sends Rd [received]. 11.55 p.m. NY – DFT [Frankfurt] and SBA [Birma] calling [Titanic]. No reply. 12:10 a.m. NY – MKC [Olympic], DFT [Frankfurt] and MBC [Baltic] calling MGY [Titanic]. No reply. 12:25 a.m. NY – SBA [Birma] tells DFT [Frankfurt] he is 70 miles from MGY [Titanic]. 12:50 a.m. NY – All quiet now. MGY [Titanic] hasn't spoken since 11:47 p. m.
1:40 a.m. NY – MPA [Carpathia] calling MGY [Titanic]. The Mount Temple was one of the ships to hear Titanic’s first wireless distress signal transmitted at 10:25 p.m. NY time. Ten minutes later, at 10:35 p.m. NY time, she picked up a revised SOS position from Titanic, the same message that was picked up by Carpathia. Mount Temple was only 49 miles away from the reported SOS position when she turned around and went full speed toward it. At that time, she was about 60 miles from where Titanic actually sank. The last that Mount Temple heard from Titanic was at 11:47 p.m. NY time, having traveled about 14 miles closer to where Titanic was during that period. From other wireless logs we find that Baltic heard Titanic at 11:45 p.m. NY time, and replied back at 11:47 p.m. The last message heard from Titanic by Carpathia was at 11:55 p.m. NY time. At 11:58 p.m., Asian heard Titanic calling SOS, answers Titanic, but received no reply. At 12:05 a.m. NY time, the land station at Cape Race says that they did not hear from Titanic for about a half hour. That would be a reference to their 11:36 p.m. intercept of a message exchange between Titanic and Olympic. It is quite clear that Titanic’s power was failing near the end. The following chart lists some of the last transmissions received from Titanic, or assumed to have come from Titanic, by various stations. For reference, the time of Titanic’s first distress message and revised position message are also listed. Unlike today, wireless receivers in 1912 were passive devices and not capable of amplifying signals. The loudness of a signal in the operators headset depended on the strength of the radio signal received at the antenna. That in turn depended on the power level of the transmitting station, the propagation loss along the signal path between transmitter and receiver, and the gains and orientations of the transmitting and receiving antennas. And unlike most communications channels today, the radio frequencies that were used were simplex channels, shared by many wireless stations that were out there clogging up the airways. In recognizing a particular transmission, the operator depended on reading specific call signs (like MGY for the Titanic or MCE for Cape Race) as confirmation that a signal came from a particular station. However, they also learned to recognize a particular operator’s touch on the transmission key, as well as the unique signature tone and harmonics sent out by the spark gap generators of some of the stations. But when signals are especially weak, and a lot of other transmissions are taking place along with atmospherics, dependence on these other factors are not very reliable. Only recognizing a call sign can one be sure as to where the transmission came from. It is possible that the last transmission sent out from Titanic may have been at 12:10 a.m. NY time. After that, it is highly questionable. Sometimes what one wants to hear, one tends to hear. As we have seen reported in the wireless log of Mount Temple, Birma’s wireless operator thought he heard Titanic calling as late as 1:58 a.m. NY time, which would be about 4 a.m. Titanic time, about the time that Carpathia was getting near the first boat to be picked up. Apparently, this occurred several minutes before he and Phillips abandoned the Marconi cabin. Looking at the timeline of last messages, it seems that we can correlate this event to the two events logged at 11:55 p.m. NY time in the table above. Converting NY time to Titanic time, it tells us that Capt. Smith released the two wireless operators about 1:57 a.m. Titanic time. Senator SMITH. You waited until the captain told you that you could leave the ship? Senator SMITH. How long was that before the ship disappeared? Mr. BRIDE. I should say it was just about a quarter of an hour. Senator SMITH. About 15 minutes? Mr. BRIDE. About 15 minutes. But how much longer did he and Phillips stay before abandoning the Marconi cabin? In an interview with a NY Times reporter on April 18th, the day the Carpathia docked in NY harbor, Bride said that they abandoned the wireless cabin 10 to 15 minutes after Smith released them. At the American Inquiry he said it was “10 minutes before the ship went down.”  Putting this all together, we have Smith releasing them at 1:57, he and Phillips abandoning the Marconi cabin 10 to 15 minutes later between 2:07 and 2:12, and we know that the ship sank at 2:20 a.m., about 10 minutes after abandoning the room. The last two wireless signals reported in the wireless log of Virginian, the transmission of two ‘V’s and the sending of a general call-up ‘CQ’ signal, just do not fit what Bride said he and Phillips did before leaving the Marconi cabin. It is more likely that they were transmissions that came from a far off land station with a rotary spark generator that was attempting to establish communications with other stations. Now with the known difference between Californian time and Titanic time firmly established, let us see what this implies concerning some lifeboat launch times and rocket firings. The time that the lights of the steamer that fired those rockets disappeared from sight was noted at 2:05 a.m. Californian time by the wheelhouse clock when Gibson was sent down by Stone to report to Capt. Lord. On Titanic the time would be about 12 minutes ahead, or 2:17 a.m. Titanic time. From many sources, including Third Officer Pitman who noted the time on his pocket watch from lifeboat No. 5, Titanic sank at 2:20 a.m. ship’s time. About two to three minutes before that, Symons and several others witnessed Titanic’s lights go out as the ship appeared to break in two. That means that Titanic was seen to go dark about 2:17 a.m. Titanic time, which corresponded to 2:05 a.m. Californian time. It was the same time that the steamer that Gibson and Stone were watching, the same steamer that fired rockets over a time span of about an hour, was seen to go out of sight. Coincidence? Not really. The observations seen by those on Californian as well as those on Titanic were entirely consistent with what was happening to both ships seen from a distance. The distress rockets sent up from Titanic were witnessed by Stone and Gibson on Californian. The first rocket was seen by Stone at about 12:45 Californian time. If precise, that would correspond to 12:57 Titanic time. The last rocket he placed about 1:40 Californian time, which would correspond to 1:52 Titanic time. But how accurate were Stone’s estimates of time? On Californian, as on other vessels, the quartermaster in the wheelhouse would strike ship’s bells every half hour. So even if the Officer of the Watch on the bridge did not have a clock or watch handy, they would note the passage of time by the striking of ship’s bells. To Stone, 12:45 a.m. would seem to be about midway between one bell and two bells being struck. 1:40 a.m. would seem to be a little closer to three bells rather than 4 bells being struck. That is probably the best he could do, and his estimates were probably within about a few minutes or so of the actual time carried on board his ship. But there are still a few questions that we must ask. Was the rocket that he saw about 12:45 the first rocket sent up from Titanic? Unfortunately, nobody that we know of was looking at a clock when rockets were being sent up. So what else can we compare his time to? Once Boxhall got those socket distress signals, he started to send them up one at a time at intervals. He was not too sure of the precise intervals, but he guessed they were sent up about 5 minutes apart. Based on what Boxhall described, it is difficult to establish an exact time for when he actually fired the very first rocket. But we know he spent some time looking at this steamer through glasses after returning from the Marconi cabin, informed Capt. Smith that he sent for some distress rockets “in the meantime,” and received permission from Smith to send them up once they arrived. What we do not know is how long it took for someone to bring him or tell him where the socket signals were kept. We can only speculate, but it seems it would be about 10 to 15 minutes after Boxhall left the Marconi cabin, give or take a few, before the first rocket went up. That would make it between 12:45 and 12:50 on Titanic. On Californian, Second Officer Stone thought he noticed the first of his 8 white rockets at 12:45 a.m., Californian time, which suggests that a rocket was sent up from Titanic at 12:57 a.m., Titanic time. But did Stone witness the first rocket sent up by Boxhall, or perhaps did he miss seeing the first only to catch the tail end of the burst of the second or third rocket which he took to be a shooting star at first? We will come back to this question shortly. Bright doesn’t say exactly when he arrived or how long he and Rowe stood there before calling up the bridge on the telephone. But Bright did admit to being late to relieve Rowe, so we know it was some time after 12:23 unadjusted Titanic time. And once getting there, he and Rowe spent some undisclosed amount of time together before they actually called the bridge. There is little doubt that the phone call that Boxhall received in the wheelhouse after firing off a rocket came from Rowe who also reported seeing a boat in the water at that time. It could very well have been lit up by the flash of light given off by that first rocket bursting high above Titanic’s decks. What we do know from Fifth Officer Lowe, is that the first rocket went up soon after the second boat, No. 5, was lowered or was being lowered, when he turned to start loading passengers into boat No. 3. According to George Rowe, distress signals were carried on Titanic’s forebridge where Boxhall was, in addition to those stored in a locker aft under the poop. However, it seems that Boxhall may have been unaware of exactly where when he sent for someone to find the distress rockets and told Capt. Smith that he did so. It must have been when that someone came back with the information as to where the rockets were kept, that he was also told that they kept more aft. So when the call came from QM Rowe out on the afterbridge, Boxhall asked him if he knew where the other detonators were kept, and to go and bring them to the forebridge. We know that Bright and Rowe each brought a box of them to the bridge when they arrived. But according to both Second Officer Lightoller and Fourth Officer Boxhall, the order to uncover the boats came close to 20 minutes after the collision, after Boxhall returned from his second inspection forward and reported seeing the mail room flooded. For the next 20 to 25 minutes, members of the deck crew were involved in uncovering and swinging out the boats while Captain Smith personally got involved in going below to see the extent of flooding for himself, and where he met up with Thomas Andrews. According to several independent eyewitness estimates, the order to load the boats with women and children came about 45 minutes after the accident,  about the same time that the first wireless distress message was sent out by Phillips (at 10:25 NY time, or 12:27 Titanic time), after the full extent and severity of the damage was realized. And then it would take at least 10 to 15 minutes to get people into a boat safely (many of whom were reluctant to do so early on), and then another 5 to 6 minutes at least to safely lower it about 60 feet to the sea by paying out the falls. So how is it possible for Rowe to have seen a lifeboat in the water as early as 12:25? Senator BURTON. Was the Titanic down by the head? Mr. ROWE. Yes, sir. When we left the ship the fore well-deck was awash; that is, when we pushed off from the ship. It was 1:25 when I left the bridge to get into the boat. When the boat was in the water the well deck was submerged. It took us a good five minutes to lower the boat on account of this rubbing going down. Senator BURTON. She must have sunk soon after you left? Mr. ROWE. Twenty minutes, I believe. Senator BURTON. Did any boats get away after yours? Mr. ROWE. One boat [Collapsible D] got away after mine, on the port side. So here we have Boxhall saying that they were working on the two collapsible boats when he was sent away in emergency lifeboat boat No. 2, and that the ship sank about half an hour after he was sent away. Rowe himself said the ship sank about 20 minutes after he left in Collapsible C. Working backward from 2:20 tells us that No. 2, with Joseph Boxhall in it, had to be lowered somewhere around 1:50 a.m. unadjusted Titanic time, and Collapsible C with George Rowe in it had to be lowered around 2:00 a.m. unadjusted Titanic time. In 1912 testimony, George Rowe said that when he was called by Chief Officer Wilde when they were getting out the starboard collapsible boat, he asked Capt. Smith if he should fire any more rockets and Smith told him “No; get into that boat.” He then went to the boat where he said he helped assist three women and three children to get it. Then, with no other women or children around, Bruce Ismay and William Carter got in, and they then lowered the boat. We also know that Titanic had taken on a heavy list to port before he left, “All the time my boat was being lowered the rubbing strake kept on catching on the rivets down the ship's side, and it was as much as we could do to keep her off…It took us a good five minutes to lower the boat on account of this rubbing going down.” Rowe also noticed that the well deck was submerged when his boat reached the water. We have already noted that Baltic and Titanic exchanged wireless messages between 11:45 p.m. and 11:47 p.m. NY time. During that exchange, Harold Bride was at the transmitter while Jack Phillips went outside to see what was going on. When he came back to the Marconi cabin, Phillips told Bride that the well deck was awash, and that they were putting women and children in the boats and sending them off. Bride himself had noticed that the ship was then carrying a heavy list to port at that time. In terms of Titanic time, Phillips was outside between 1:47 a.m. and 1:49 a.m., about the time that lifeboat No. 2 was being lowered with Fourth Officer Boxhall in it, and about 10 minutes before Rowe left the ship in Collapsible C.
So how does Collapsible C being lowered at 2:00 a.m. fit with Rowe saying he was called to get into the boat at about 1:25? It is quite clear from what he described that Rowe did not spend 35 minutes at the boat before it was lowered. The answer to the riddle about Rowe’s stated times comes from the way they adjusted clocks on Titanic. On the night of April 14, clocks used by the deck and engine department crews (who kept regular sea watches) were to have been set back 23 minutes in one watch and 24 minutes in the other watch, for a total planned adjustment of 47 minutes. Because of the accident, these clock adjustments did not take place, and were in fact negated because the ship was stopped and would not have reached her planned noontime longitude for Monday. But there were some in the crew who did not realize that, and assumed that the first of two clock adjustments had taken place as planned. We have seen that Bright had said that he was to have relieved Rowe at 12 o’clock. But that would have been on an adjusted clock set back 23 minutes. In unadjusted time, it would have been 12:23. Rowe’s reference to 11:40 and 12:22 in his 1963 letter are undoubtedly references to unadjusted time on a clock set for April 14th hours. He knew and expected that the clock was to be put back near midnight to extend his time on watch by a little over 20 minutes. There were others who also said that they expected to get about 20 minutes more to work before going off watch. Lookout Frederick Fleet told Senator Smith that “we [he and Reginald Lee] were to get about 2 hours and 20 minutes” up in the crow’s nest. Fleet and Lee had started their lookout watch up in the nest at 10:00 p.m., and were have come down from the nest 2 hours and 23 minutes later. Trimmer Thomas Dillon, when asked if knew what time it was when he was ordered up on deck, told the Wreck Commission, “I noticed the clock, but I did not take any particular notice what time it was. The clock was put back about 20 minutes, I think.”  It is clear that Dillon only assumed that the clock had been put back, but we see that he expected an adjustment of about 20 minutes, just like Fleet. Thomas Dillon’s watch began at 8:00 p.m., and was to have ended at 4 hours and 23 minutes later if it weren’t for the accident. Being out on the poop deck alone, Rowe had no idea that they never got around to altering any of the clocks because of the accident. And he probably never bothered to ask. 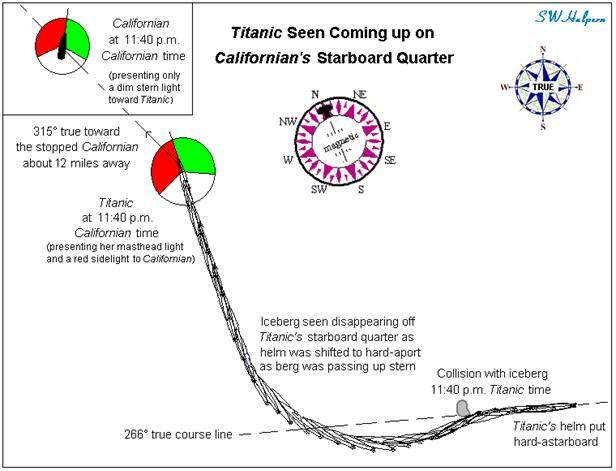 If we convert 12:35 Californian time to Titanic time, we find that Stone went to the speaking tube to answer Capt. Lord’s call at 12:47 a.m., the same time that the first rocket was sent up according to the rationale used in the Wormstedt, Fitch, Behe lifeboat article. If a rocket went up from Titanic at that time, Stone would not have seen it. The authors of the lifeboat article had originally assigned a time for the last rocket firing at 1:44 a.m., just one minute before the 1:45 a.m. time assigned to the launching of lifeboat No. 2. The rationale for that was Boxhall’s claim that he was firing rockets right up until the time that he left the ship in No. 2, which they started to lower just as he got there. The assignment of 1:45 for a launch time for No. 2 was not explained. However, it was noted that Collapsible D, which we have seen was worked on earlier by Quartermaster Robert Hichens, and also worked on earlier by Able Bodied Seaman Thomas Jones,  was loaded and launched from same davits that were used to launch emergency lifeboat No. 2. Collapsible D was assigned a launch time of 2:05 a.m., 20 minutes after No. 2 was launched. These times were also the same that were put in the Wreck Commission report. On Californian, Second Officer Herbert Stone thought the last of the 8 white rockets that he saw went up at 1:40 a.m., Californian time. If correct, that would suggest a rocket was sent up from Titanic at 1:52 a.m., Titanic time. This certainly is in good agreement with Boxhall’s estimate of being sent away about half an hour before the ship sank, and with Rowe being sent to Collapsible C in time to assist filling it with a few remaining passengers and leaving the ship about 20 minutes before it sank. So it seems very likely that Stone did indeed see the very last distress signal rocket sent up from Titanic. But if Stone’s estimate of 1:40 Californian time was accurate, that implies that the last rocket went up from Titanic at 1:52 a.m., Titanic time, which suggests two possibilities: The first, is that lifeboat No. 2 with Boxhall in it was launched a little later than 1:45 a.m.; the second possibility, and more likely in my opinion, is that Boxhall was not the one who actually fired the last rocket from Titanic. If this account is true, then it seems that Rowe was the last person to fire a rocket from Titanic. But in his 1912 testimony, as we have seen, Rowe said that he asked Capt. Smith if he should fire another rocket when Wilde wanted a sailor to man the boat, and that Smith told him, “No; get into that boat.” Either way, it seems that Boxhall was no longer there supervising the firing of rockets, having been sent away a little earlier in emergency lifeboat No. 2. Senator FLETCHER. Did you see him [Capt. Smith], Hardy? Mr. HARDY. Yes, sir; I did. Senator FLETCHER. Where did you see him? Mr. HARDY. On the bridge, before our boat left. Senator FLETCHER. What was he doing? Mr. HARDY. He was superintending the rockets, calling out to the quartermaster about the rockets. Senator FLETCHER. That is the last you saw of him? Mr. HARDY. Yes, sir. He walked on the deck, watching the filling of the boats. That is the last thing I saw of him. John Hardy left Titanic in Collapsible lifeboat D, the very last boat to be lowered from the ship, and a boat that used the same davits to lower emergency lifeboat No. 2 with Boxhall in it earlier. Thus we see that Capt. Smith was there on the bridge supervising the firing of rockets after Boxhall left, and it was Capt. Smith who had to be the one to decide when the last rocket was sent up. Further evidence comes from Mrs. Mahala Douglas who said goodbye to her husband Walter Douglas as she was being lowered away in emergency lifeboat No. 2. “That was the last word I ever spoke to him,” she later recalled, “They were putting off rockets on the deck as we got away.”  With Second Officer Boxhall in charge of her boat, it could only mean that someone other than Boxhall was still sending up rockets after Boxhall was sent away in boat No. 2. Since Quartermaster Arthur Bright was first sent to the starboard side to work on Collapsible C before going over to the port side to work on Collapsible D, it seems that Quartermaster George Rowe was indeed the one who actually sent up the last distress rocket from Titanic. And that means a firing time of around 1:50 a.m. for the last rocket fits very nicely with the time that Rowe thought he left the bridge to go to boat C (1:48 in unadjusted hours), and with Stone’s estimate of when the last rocket was seen from Californian (1:52 Titanic time). As Rowe pointed out, when he got to the boat there were only a few more passengers to be put in it before the boat was lowered away with him in it. All of this supports a launch time of around 2:00 a.m. for Collapsible C, just 20 minutes before Titanic sank. Rocket observations seen from the upper bridge of Californian correlates extremely well with the times that rockets were sent up from Titanic. Rockets sent up from Carpathia about 3:20 a.m. were also seen from the upper bridge of Californian when Carpathia was a least 10 miles beyond where Titanic had been. The flash of a detonator that appeared to come from the deck of the vessel that Gibson had under observation while looking through glasses essentially proves that the uppermost decks of Titanic were above the visual horizon as seen from Californian. Clocks on Titanic were 12 minutes ahead of clocks on Californian, and Titanic time was 2 hours and 2 minutes ahead of New York time. The American Inquiry, the British Inquiry, and the Limitations of Liability Hearings had reach three different conclusions regarding the difference in time between Titanic and New York. All three were wrong because they failed to look into the navigational evidence that determined exactly what that difference really was, and failed to pursue evidence of how clocks were adjusted on board Titanic. The last signals heard from Titanic by relatively nearby ships was about 20 minutes before Titanic sank. The last wireless signal sent from Titanic was a “CQD MGY” call transmitted about 10 minutes before the ship went under. Some late wireless signals attributed to Titanic do not fit what we were told happened in the last few minutes by Titanic’s sole surviving wireless operator. Some of those extraneous, weak, and unconfirmed signals most likely came from a far away wireless land station trying to establish contact with other stations. The lights of the steamer from which those 8 white rockets seen by Stone and Gibson “had gone out of sight” at 2:05 a.m. Californian time. This corresponded to 2:17 a.m. Titanic time when the lights of Titanic were seen to suddenly go out as the hull seemed to split in two. About 3 minutes later, the remaining stern section was seen by many in the boats to upend and sink below the surface. The first rocket seen by Californian’s Second Officer Stone about 12:45 a.m. Californian time, may not have been the first rocket that was sent up from Titanic. It is likely that Stone was busy at the speaking tube talking to Capt. Lord when the very first rocket was sent up about 10 minutes earlier at 12:35 a.m. Californian time, or 12:47 a.m. Titanic time. The last rocket fired from Titanic was likely sent up by Quartermaster George Rowe about 10 minutes before getting into Collapsible boat C. On Californian, that rocket was seen about 1:40 a.m. Californian time, or 1:52 a.m. Titanic time. I would like to thank researchers George Behe, Tad Fitch, J. Kent Layton, and Bill Wormstedt for their encouragement and review of this work. Any errors or omissions are solely my own responsibility. This article first appeared in Titanic International Society's Voyage 70, Winter 2009 issue, and in British Titanic Society's Atlantic Daily Bulletin, December 2009 issue. The actual bearing to the stopped steamer given in evidence by both Second Officer Stone and Third Officer Groves was south-southeast by standard compass. Taking into account the reported magnetic variation and compass deviation presented in evidence by Capt. Lord and Chief Officer Stewart, the bearing to the stopped steamer would be to the southeast true. Signed statement by Second Officer Herbert Stone to Capt. Stanley Lord, April 18, 1912, at sea on SS Californian. Signed statement by Apprentice James Gibson to Capt. Stanley Lord, April 18, 1912, at sea on SS Californian. These socket signals, made by the Cotton Powder Company in Faversham, were explosive shells sent up by a detonator charge fired from a socket similar to today’s fireworks. The faint luminous tail alluded to by both Boxhall and Gibson was the burning fuse of the shell as it was sent aloft to a height of 600 to 800 feet. From their individual signed statements to Capt. Lord on April 18, 1912. Californian came under the influence of the southerly moving Labrador current sometime between noon and 4 p.m. on April 14, 1912. This can be verified by the sharp drop in water temperature readings taken from Californian every 4 hours that were submitted as evidence to the American Inquiry (p. 1142). The drift of the wreckage compared to the now known location of the Titanic wreck site is a good measure of the strength of this drift. The compass in 1912 was divided into 32 points of 11¼ degrees each. It was marked in degrees as well, there being 90° in each of 4 quadrants. The arc of illumination of a ship’s red sidelight was from straight ahead to 2 points aft of the port beam, covering 10 points of arc. The green sidelight was from straight ahead to 2 points aft of the starboard beam, also an arc of 10 points. A white stern light showed an arc covering 12 points, from to 2 points aft of the starboard beam around the stern to 2 points aft of the port beam. And white masthead lights covered an arc of 20 points, showing from to 2 points aft of the port beam around the bow to 2 points aft of the starboard beam. In his signed statement to Capt. Lord, Gibson remarked that it was several minutes after he came up on deck (about 12:15) with coffee that Stone told him about the steamer that had stopped off their starboard bow. And then to see it for himself, he had to look over the weather cloth that was carried on the upper bridge. Time that we keep today is called mean time and is based on the path of a fictitious sun that revolves around the earth in precisely 24 hours. The real sun, however, does not move that uniformly because the earth’s orbit around it is not exactly a circle, and the earth’s axis is tilted with respect to its orbit around the sun. Because ships carried different times that changed every day, wireless messages were not logged by ship’s time in 1912. Instead, wireless messages were logged in Greenwich Mean Time (GMT) for ships that were east of longitude 40° W, and logged in New York time (mean time for the 75th west meridian) for ships that were west of longitude 40° W. The time difference between GMT and NY is exactly 5 hours, with GMT ahead of NY. When Titanic sent out her first distress message by wireless, it was received at 10:25 p.m. April 14, 1912, NY time. Samuel Halpern, “Keeping Track of a Maiden Voyage,” The White Star Journal of the Irish Titanic Historical Society, 2006, and Encyclopedia Titanica, February 2007, www.encyclopedia-titanica.org/keeping_track.html. Using some precise values, noon on Californian for longitude 47° 25’W was at 15:09:57 GMT, and noon on Titanic for longitude 44° 31.4’W was at 14:58:23 GMT. The precise time difference would have been 11 minutes 34 seconds with Titanic’s clocks ahead of those on Californian. It should be noted that the American Inquiry decided that Titanic time was 1 hour 33 minutes ahead of NY, the British Inquiry decided that Titanic time was 1 hour 50 minutes ahead of NY, and at the 1913 Limitation of Liability Hearings in NY the White Star Line decided that Titanic time was 1 hour 39 minutes ahead of NY. None of these times were correct as we shall soon see. The issue of how clock changes were made, and other related time issues, are covered in great detail in my two-part article, “The Mystery of Time,” published in The Titanic Commutator of the Titanic Historical Society, Vol. 31, No. 178 and No. 180. During the collision with the iceberg, Titanic’s helm was shift from hard-astarboard to hard-aport as the iceberg was passing aft of the bridge (American Inquiry, p. 527). As a result, Titanic started a turn to starboard as shown in the scale diagram. This was reported by several eye witnesses, including AB Joseph Scarrott (British Inquiry, 355). When Titanic came to a stop, her head was pointing northward as verified later by QM George Rowe (British Inquiry, 17670-17673), and Californian was pointing toward the NE (by compass) as noted by her 3/O Charles Groves. At that time she would have presented a relatively dim stern light toward Titanic which easily could have been overlooked for an ordinary star near the horizon. By time 2/O Stone arrived, Californian swung around to starboard enough for her bright masthead lights to come into view from Titanic. Oceanic Steam Navigation Company was the official name of the White Star Line. American Inquiry, p. 918. He also said he used 11:46 p.m. in his calculations to arrive at his SOS position. The Boxhall CQD longitude was 50° 14' W. Expressing this in degrees, we get 50.23 degrees west of Greenwich. If we divide this number by 15 degrees per hour, the earth’s speed of rotation, we get 3.35 hours, or 3 hours 20 minutes and 56 seconds. Rounding that to the nearest minute, we get a time that is 3 hours 21 minutes behind GMT, or 1 hour 39 minutes ahead of NY. Senan Molony, “Titanic time: Tested by wireless,” Titanic International Society’s journal Voyage, No. 143. Transcribed from the Procès-Verbal of SS Virginian. Transcribed from the Procès-Verbal of SS Mount Temple. Titanic was equipped with a rotary spark generator which produced a distinctive tone in the signal received. At the time, Titanic was the only ship at sea to have one. But rotary spark generators were used by several land stations. Transmitting the letter ‘V’ was used by stations when tuning a transmitter. The transmission of the letters ‘CQ’ were used as a general call up signal when a station came on line and wanted to communicate with other stations that may be listening. Report from Harold S. Bride to W. R. Cross of the Marconi Company, April 27, 1912. The distance between the two stopped vessels was likely in the neighborhood of 12 nautical miles, with Californian on a line of bearing 315° true from Titanic. See my four-part article, “Light on the Horizon,” published in The Titanic Commutator of the Titanic Historical Society, starting with Vol. 31, No. 177, for a full explanation. Unlike previous methods used by others that relied heavily on selective subjective evidence, the methods I used were based on a comprehensive scientific approach that took into account several independent analytical methods, as well as the now known location of the Titanic wreck site. British Inquiry, 1017-1018, 1053-1055, 1082-1096, 1199-1204. American Inquiry, p. 832. Bright’s reference to “12 o’clock” was for adjusted time on the wheelhouse and engine room clocks which controlled the watchkeeping schedules of the deck and engine department crew on board ship. Wynn said he awoke at the time of collision, went on deck and saw ice in the forward well deck, and then went down to wake his two mates, Quartermasters Bright and Perkis. He then went back up on deck to await orders. (British Inquiry, 13394.) Perkis said he was awakened by the ship’s joiner who “told us we had better turn out.” Perkis remained below until he thought it was time for him to report to the bridge. (American Inquiry, p. 581.) We know he went to relieve Hichens who was at the helm. Wynn, meanwhile, was drafted to uncover the boats along with others about midnight. After working awhile at that task he went back below to his quarters to get a kit bag and a knife. (British Inquiry, 13395.) It is probably then that he noticed that Bright had not turned out, and told him that the ship was going down by the head. In correspondence between J. Powell, District Manager of the MMSA, and Leslie Harrison on June 12, 1963, Powell wrote that in response to his question concerning when the first boats were lowered, Rowe replied: “It was perhaps near to 12:30.” He also reported that Rowe said that they were firing rockets whilst he was still on the poop, and when he brought the other rockets along to bridge, they used some of those as well. American Inquiry, p. 522. According to the Wreck Commission Report (p. 19), the ship carried a total of 36 distress socket signals. It appears that the socket signals were stored in watertight metallic cases containing 12 signals each. Colonel Archibald Gracie, The Truth About the Titanic, Mitchell Kennerley, 1913, Ch. 2. Also see testimony of AB Poingdestre (British Inquiry, 2844-2874) regarding hearing Capt. Smith give the order to load the boats with women and children. This accounts for the 6-to-1 mechanical advantage in the pulley system and assumes the falls were payed out at a rate of 1 foot per second. American Inquiry, p. 451. Clocks in the wheelhouse, engine rooms and crew’s quarters kept what the IMM Co. rule book called ‘Bridge Time.’ Those were the clocks that regulated when ship’s bells were struck, and therefore the watchkeeping schedules for the officers, seamen, engineers, stokers, trimmers, and greasers. It appears that those clocks underwent two separate adjustments each night. Clocks in public spaces, however, may have been adjusted only once every night by the full adjustment amount. There were several passengers who stayed up late in the smoking rooms waiting for the clocks to change at midnight so they could adjust their personal timepieces to the time for the next day. The ship carried two master clocks that were used to set a number of slave clocks that were scattered throughout the ship. In another correspondence between J. Powell and Leslie Harrison on May 20, 1963, Powell reported that Rowe told him that “he definitely did not adjust his watch.” Powell also reported to Harrison in an earlier correspondence on March 5, 1963, that Rowe said he “did not think of, or about a watch” when he was specifically asked if he estimated the time or looked at his watch when he saw the first boat in the water. It is also interesting that Rowe told Powell at that time that the first boat was launched at 1:00, and the first rocket was fired at 1:00 on “instructions of Master.” We have already seen that later in June, Rowe said the first boats were lowered “perhaps near to 12:30.” In 1963, George Rowe was 83 years old. In the Wreck Commission report, they had launch times for boats No. 7, 5, 3, and 1 listed as 12:45, 12:55, 1:00, and 1:10, respectively. A first rocket going up at 12:57 based on Stone's observation would fit right between the times listed for boats No. 5 and No. 3 in that report, and certainly gives No. 7, which they listed at 12:45, enough time to have reached the water and pull enough away from the ship to be seen from the afterbridge. However, accepting 12:57 as the time for the first rocket means that Rowe had to call the bridge much later than when he said he did, which does not seem likely. Quartermaster Arthur Bright was then busy working on Collapsible D when Rowe was sent to take charge of Collapsible C. Bright said he first went to C to assist in getting it up and swung out. He did not participate in loading it, but he did notice Bruce Ismay standing there. Instead of staying to load that boat, Bright was sent over to the port side to get D swung out and loaded with passengers. He also said that all the other boats had been sent away before any of the collapsible boats left the ship. (American Inquiry, p. 833-836.) Bright also assumed that Rowe was sent to the port side to work on D when he was first sent to work on C on the starboard side. That assumption is not supported by any of Rowe’s accounts. Bright said that he only learned that Rowe left in Collapsible C later on, most likely while he was on the Carpathia.